I know this. Do you? Posted: Fri Jun 15, 2012 8:13 pm Post subject: I know this. Do you? 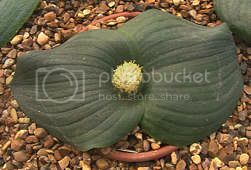 I have it down as Massonia Depressa, but as you know they often keep changing the botanical names of plants. It likes to be dry in our winter as that is equivalent to its summer in S.A. It needs a sheet of glass over it, here.